This week marks the seven-year anniversary of the last time the federal minimum wage was raised, from $6.55 to $7.25 on July 24, 2009. Since then, the purchasing power of the federal minimum wage has fallen by 10 percent as inflation has slowly eroded its value. However, this decline in the buying power of the minimum wage over the past seven years is not even half the overall decline in the minimum wage’s value since the late 1960s. As the figure below shows, at its high point in 1968, the federal minimum wage was equal to $9.63 in today’s dollars1. That means that workers at the minimum wage today are paid roughly 25 percent less than their counterparts 48 years ago. Note: Growth in average wages measures average wages of production workers. Measuring the minimum wage against changes in prices is only one way to think of where the wage floor could be today. 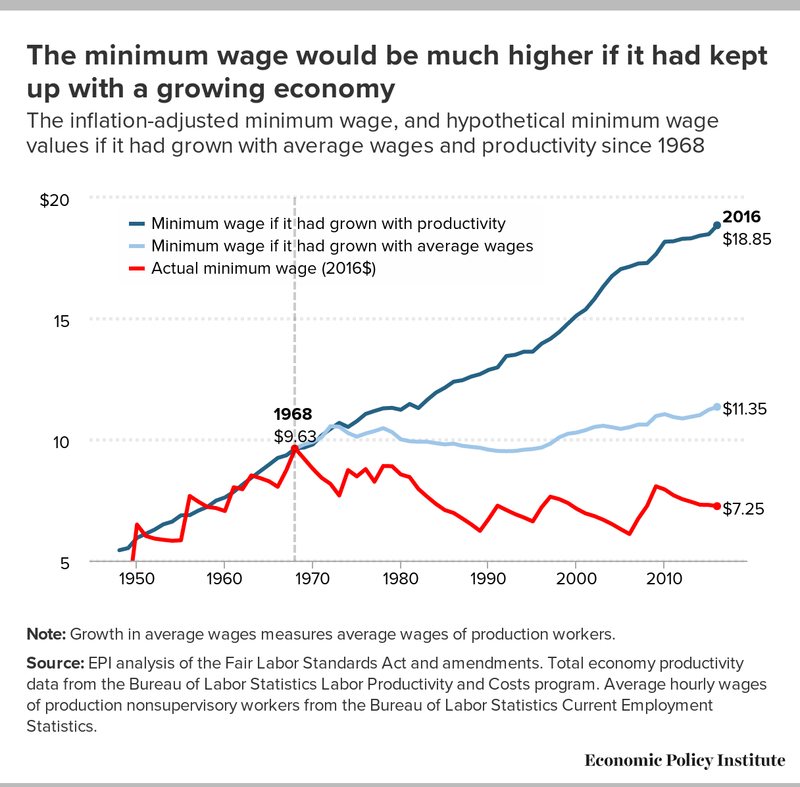 Given growth in the economy and improvements in labor productivity over the past half century, the minimum wage could have been raised to a point considerably higher than its 1968 inflation-adjusted value. As the middle line in the figure shows, if the minimum wage had been raised since 1968 at the same growth rate as average wages of typical U.S. workers—measured here by changes in average hourly earnings of nonsupervisory production workers, a group that comprises roughly 80 percent of all U.S. workers and excludes highly-paid supervisors and executives—the minimum wage would be $11.35 today. Prior to 1968, the federal minimum wage was raised at roughly the same pace as growth in labor productivity—i.e., the rate at which the average worker can produce income from each hour of work. This makes sense – if the economy as a whole can produce more income per hour of work, it means there’s capacity for wages across the distribution to grow at a similar rate. Had the minimum wage risen at the same pace as productivity after 1968, it would be nearly $19 per hour today. 1. Adjusted for inflation using the CPI-U-RS.